Please fill out the above form and save it to your computer. Note that you can type directly in the fields of this PDF form. Then save and email it as an attachment to dogs@totalteamworktraining.com. Family Dog Training is a six week course designed to involve the whole family. Family members learn to teach the same exercises using the same hand signals and words. The dogs become increasingly comfortable in the presence of other dogs and children in the structured classroom setting. Class size and instructor ratios are the key in giving each family personal attention. We focus on good house manners, such as greeting visitors without jumping up, settling down when the energy level is too high, taking walks with the family instead of pulling them down the road, and coming when called. We use humane training methods incorporating positive reinforcement and a step by step approach stressing success at each level. Our Family dog Training workbook and our Head Start Puppy Training workbook are written to follow along each week of class. These training books can refresh your in-home program throughout your dog's life. Each class is designed for active learning and quiet time teaching your pup to settle down in the presence of distractions. We use some agility practice equipment to add challenges to our work station setting. Since our classes are taught with progress and success in mind, it’s easy to start your puppy early and work your way through the challenges of doggy adolescence toward specific goals for maintaining manners or sharing new adventures. Does your dog have C.L.A.S.S.? C.L.A.S.S., which stands for Canine Life and Social Skills, is an educational and hands-on program to promote training of practical skills and to improve the bond between people and their canine companions through positive reinforcement. C.L.A.S.S. also features an assessment of the owner’s understanding of basic dog handling and care. Dog owners can earn a B.A., M.A., and Ph.D. for their dog in this program created by the Association of Pet Dog Trainers. Service and therapy dogs use C.L.A.S.S. to sharpen practical skills. Shelter and foster dogs with B.A. degrees are more attractive to potential adopters. Some of the real-life skills assessed in C.L.A.S.S. are settling on cue, coming when called, walking politely on leash, waiting to be released to a food bowl, and responding to “leave it” in the face of temptation. The dog learns to ignore more challenging distractions each level up. For example, at the M.A. level the dog waits before being released from an open car and responds to the owner even when offered a treat from someone else. At the Ph.D. level, the dog demonstrates table manners during a simulated dinner scenario and comes directly to the owner when called past food and toys. Most of us want to include our dogs fully in our lives, which is much easier when we give them boundaries and skills with real-life relevance. C.L.A.S.S. shows dog owners how to teach these skills using effective, reward-based methods. Reward-based training methods minimize the use of punishment and are fun for both owner and dog! Go to www.mydoghasclass.com to register your dog and download the comprehensive Student Handbook for a description of the test items for each C.L.A.S.S.™ level. You and your dog can have C.L.A.S.S.! Head Start Puppy Training is a four week course designed to target puppies between 10 and 16 weeks of age. This class teaches the family how to create the ultimate puppy environment and sets everybody up for success! We even recommend this class for potential puppy owners. The class fields questions and concerns over typical puppy problems. House training and chew toy training and crate training are stressed in building a program to teach puppy everything he needs to know to have a long and happy life in his new home. 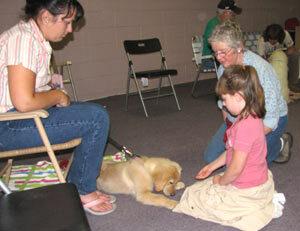 Social contact with other puppies and children in the classroom environment provide many learning opportunities for each family learning how to “read body language” and participate in the play with appropriate rules. The puppies learn acceptable play with others of their species. One-on-one behavior and training consultation is tailored to suit the lifestyle and needs of one family. We come to your home, and through a detailed behavior profile we help address the primary concerns and issues of the individual family dog. Together, we determine realistic and attainable goals within the timeframe of our scheduled visits. Each of these programs is designed to help the family dog become more compliant. These programs are only successful with the dedication and work of the entire family. There are no magic pills or quick fixes. Success with the family dog takes the commitment of the family and a consistent program and routine. We are here to provide the skills and encouragement and sometimes nagging to help our families succeed. As instructors, we continue to gain knowledge of canine behavior and learning theory and to enhance and improve our classes and private consultations on a continual basis. We also modify the program to suit the needs of the individual families and dogs. Children are welcome to participate in our class. We have clear rules and boundaries for their participation. It provides all of our student dogs the opportunity to socialize around well behaved kids. Our kids learn kindness and compassion and responsibility along with teaching their dogs tricks and manners. We love what we do and wish success for each of our clients and their chosen pets. Contact us today for your FREE initial consultation!